I have been into SEO profession for around five years now. I have worked with SEO firms, done my blogs’ SEO, and worked with many clients online. I have learned one important thing is just doing something blindly doesn’t work in SEO. You must analyze the competition, track the progress, and then take actions accordingly. This way works the best. When I started working on SEO projects in the year 2010, I was asked to do frenzy submissions in the directories, classifieds, article sites, and few other submission sites. For some time, the things were working, but after the Google’s Panda, Penguin, and other algorithms had rolled out, things were changed a lot for SEO industry. If I talk about SEO in the current scenario, you must first analyze everything such as competition, the website, keywords, existing links, crawl errors, HTML improvements, page speed, and so many other things. Because you need to make the website better in all aspect. But checking out these things manually is very tough, and there come various tools to do these checks for you. Content: This option shows the information about the duplicate content issue within your site. For blogs, the home page mostly shows low uniqueness because the excerpts on home page do exist on the post pages as well, so if you see this, then don’t bother about it, but for the single posts, and pages it shows the accuracy in percentage, if you see very small percentage then that is the matter to think. Tags: When it comes to on-page SEO, Some HTML tags that are important for SEO must not be miswritten or missing. Meta tags, Heading tags, B tags, EM tags, and strong tags are a few that are very important for optimizing the content for search engines. This tool lets you know whether these tags are present or not, and if present then whether they are correctly placed or not. Text: When you write content for your website or blog, you must take care of the repetition of words because when you repeat same word or same phrase so many times, the content can have the danger to get an over optimization penalty from Google. Repeating same words or keywords in the article normally referred as Keyword density, and that must be below the 2% in my opinion. You must not break the flow of the content just because you want keywords to add. Add them naturally, if they don’t fit, then don’t use them. So, this option of SEOmator tells you that which words are repeated how many times. You can check them and make your article a natural one. 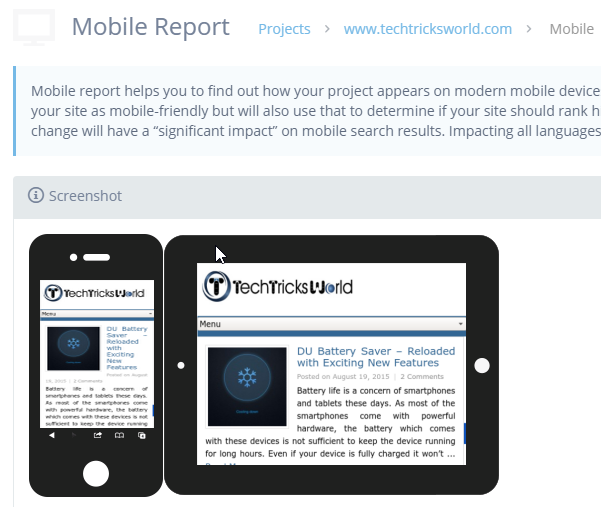 Mobile: This option shows you that how your website looks on different devices. It’s important to know that your site is mobile friendly or not because Google prefers mobile friendly sites in Google Mobile Search. Structured Data: The HTML5 structured data specification is a way for label content to describe a particular type of information: reviews, person information, or events. Structure: This option lets you know how the website’s data is structured. It displays the hierarchical structure of the site’s pages. 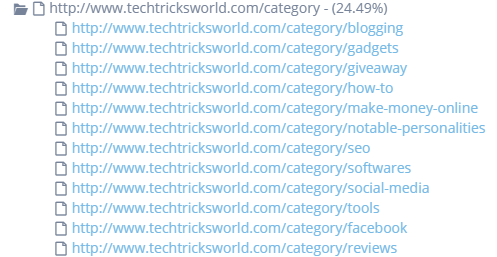 In the above screenshot, it is showing that under the category directory, there are different sub-directories present. This tool can be greatly helpful when you are in need of analyzing a website’s hierarchical structure. Links: This option gives you every detail of links as how many internal links the website has, how many backlinks it has, a comparison graph of Dofollow and Nofollow links, etc. I have taken the summary screenshot of this option, but when you actually go this option, you can see a lot more options there that can be beneficial if you are doing link analysis of a site. Page Speed: As the name says, this option lets you know the page speed of a web page. It suggests few things as well that you can implement to improve the page speed to a good extent. You can analyze the results, and if you find your content is hard to read and understand by the readers, you may change your writing style. Social: This option lets you know that which social profiles are linked to the site. Backlinks: This option gives you the number of backlinks the website has, and it also provides a comparison chart for Dofollow vs Nofollow links. Organic Report: This tool shows the keywords that are getting traffic to your site. I have checked for my site, and it showed a few only which is fine, but that is not a big list. That’s still good from a Free tool. Crawl Report: This option lets you know how SE Mator crawler crawled your website. In the free subscription, it only crawls 50 pages of the site you test with it. This option also lets you know the response code of the pages. PDF Export: You can export the full report as PDF file to save on your computer. I have defined all the options one by one, and I am sure you are now better aware of the options SEOMator offers. However, when you actually check your site with this excellent tool, you can see there are so many options as well. If I start to explain everything, this post will go very long, and you will get bore of reading. So, it’s better that you try out this tool yourself now. It does On-page and off-page research of the website. That means it is a complete SEO audit tool. The charts are displayed to give you better insights of the analytical data. 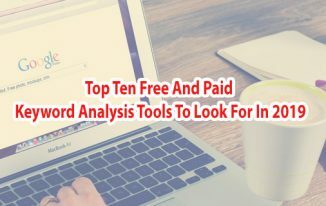 You can get 50 pages of your website crawled and analyzed with this tool for Free. How to get started with SEOMator? Visit the website www.seomator.com, enter your website URL . 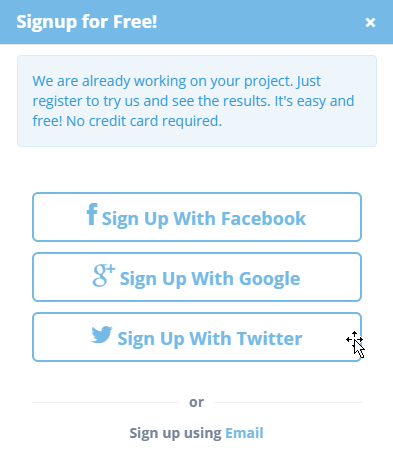 And click on “Sign UP FOR FREE”, then you will be asked to sign up. Just do that either with Google+, FB, Twitter or by email. And wait for the tool to analyze the site you have entered. Within few minutes, you will be able to see the report that contains all the options I have described in this review. You can go to each option one by one, and carefully analyze your full website, and then take actions to improve it. It has both free and premium plans that you can choose as per your requirements. Check out the plans & pricing page to know more on this. 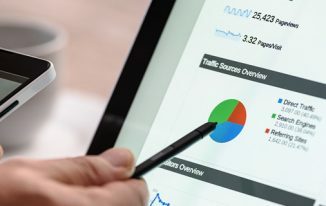 Website’s SEO analysis is very important because you need to know what problems your website is facing that don’t let your site rank well in SERPs. Until you don’t the exact issues, you cannot fix them. So, SEOMator helps you by reducing your work and analyze the full website within a few minutes. Your work is just to have a look at the report it generates, and then take actions to overcome the issues. I am sure you will enjoy this tool. Hi Atish, SEOmator is new but very useful software for online marketer and webmaster like you and me for SEO audit of a website. Though, I haven’t used it in past, but after reading your post I know many new things about this software. I will definitely use this software in the near future. Thanks for coming by. I have started using it a few weeks ago, and found it good enough for many things. As you say things are completely changed in SEO, we need to more concentrate in On-Page SEO. For improving On-Page SEO performance we need to audit our website perfectly. Various Tools are playing good job for this. All tools which are mentioned by you are very popular. I use Woorank and Majesticseo. I never heard about Seomator before. But got a clear idea about this tool from your article. Thanks so much for sharing this informative article. Thanks for checking out this review Moumita. Yes this tool is very new to me too but its fair. I liked it. Hope you will try this as well and share your views. 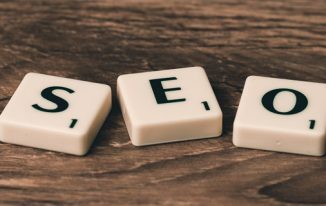 Great post on SEO Marketing. Today, there are a lot of things we need to know and do. You really stay on top of these methods you use and the one’s you are teaching us. There are so many tools to use. The one you covered, Seomator, looks easy enough to learn. All we have to do is follow tour instructions. You have an awesome night and rest of the week, Atish. I am glad you liked the post. Just check this tool and share your opinion whether it is doing what you want from it or not. Thanks for sharing this seo tool. It is very useful for beginner loggers like me. I was looking for something similar that is free. I will definitely going to use this for my blog. It will definitely gonna help you. Just try it out. Its free. Yes its free and good enough. I am happy that you found it good. I use woorank, ahrefs, semrush and opensiteexplorer for website audit and analysis. I know few other tools like SEOprofiler, Majestic SEO, SEO monitor and many more but i have heard SEOMator very first time in your blog. I think it will be good alternate of other SEO tools. You already have so many tools in your arsenal. Just add this into it too, and you won’t regret using it. Its nice. I have been working in this field from almost 4 years now and I have gone through the paid versions of SEMrush and Majestic SEO. Auditing a website is the first and only thing every experienced SEO expert will do before planning the strategies. I have Just sign up to the tool to see what information it gives and how can I get the benefit. Will share with you what I found out with this study. I have not tried this tool. It’s good to know. Thanks for sharing it. I will try this out. Is it paid tool? Yep i will check it. It is a free tool at a basic level, but if you want more features and flexibility then you have to go for its premium plan. Waw… Atish! Great tool! and excellent article. I am eager to use this SEO Audit tool. Plz Keep posting with new ideas regarding this tool. Thanks for the good words Astha. Good that you have heard about a new tool today Sourav. Yes, I have used many other tools for initial website SEO audit. This is comprehensive and easy. The best part of this tool is generating leads. This is most useful for SEO consultant or companies who are providing SEO Services. SEOMater seems awesome. I havebeen using Moz, Ahrefs, Semrush, LTP (Long Tail Pro) and more tools since I landed in SEO! Great to know that Muhammad that you are already using a handful of tools. I really hadn’t heard about that tool but it seems so useful ! I’ll think about it but I’m pretty sure I’ll use it soon ! Thank you for you article !